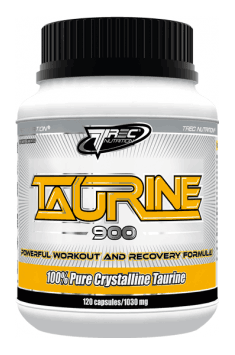 Trec Nutrition Taurine 900 is a dietary supplement consisting of the crystal clear taurine in the form of easy-to-swallow capsules. Each of them contains up to 900 mg of the active substance. The product promotes improving the physical performance, increases the endurance and accelerates the post-workout regeneration rate. In addition, it has a number of health-promoting properties - it optimizes the glucose metabolism, strengthens the heart, protects the liver and positively affects the nervous system. Taurine (2-aminoethanesulfonic acid) is one of non-protein amino acids that contains sulfur in its structure. It is present in the brain, retina, heart and skeletal muscles. Small amount of taurine is produced in the body from cysteine and methionine. In addition, it is delivered along with food - the excellent source is fish, seafood, meat, lentils and peas. Taurine plays a significant role in the biochemical processes which take place in the body. In terms of systemic activity, it fulfills all the criteria of the neurotransmitter, except one - no receptors were identified that would be appropriate for taurine. However, its effect on the central nervous system is well documented and it does not raise any doubts. In addition, it is involved in the conjugation of bile acids, strengthens the contraction force of the heart muscle and improves the transport of creatine. Taurine is said to be a substance that has a positive effect on sports performance. The amateurs of the strength and endurance sports willingly reach for it. It shows the ability to increase the efficiency and resistance to the physical effort. Several studies have shown that runners, cyclists and triathletes who supplemented their diet with taurine were able to perform much longer and more intense training. The exact mechanism behind these properties is not known. It probably consists of several different aspects. The antioxidant and anti-inflammatory potential of taurine plays a significant role. An ntense aerobic exercise induces overproduction of reactive oxygen species, which can lead to the oxidative damage that negatively affects the athletic performance. Studies have proven that the reduction of oxidative stress positively affects the process of skeletal muscle contraction. The excessive physical exercise also generates an increase in inflammation in the body, and taurine has the ability to regulate the inflammatory response. It was observed that taurine promotes the calcium homeostasis in skeletal muscle. The researchers suggest that as a result of the interaction between the skeletal muscle membrane and taurine, the release of calcium into the skeletal muscle fibers, which generate power generation, is intensified. The tests have shown that over time the body which undergoes a high physical load stops producing the required amount of taurine, which makes the muscles weaker. Taurine supplementation may accelerate the rate of body regeneration after an intense physical exercise. This organic compound improves the carbohydrate metabolism and promotes the glycogen resynthesis. Indirectly, it can also stimulate the anabolism and limit the catabolism of muscle proteins. The studies have also shown that supplementing the taurine deficit promotes a positive nitrogen balance, thus it helps to create the optimal environment for muscle hypertrophy in the body. Taurine can contribute to the preservation of the muscle mass and promote the regeneration also by providing an access to nutrients. It works well especially with creatine, by improving its transport to muscle cells. In addition, in one study it was proved that the combination of taurine and branched chain amino acids BCAA significantly reduces the muscle pain after an intense exercise. Taurine promotes the health of heart and circulatory system. It protects against overloading the heart muscle, reinforces its contraction strength, prevents the occurrence of arrhythmias. It has a positive effect on blood pressure, helps to maintain adequate cholesterol and homocysteine levels. Taurine also protects the liver. This amino acid shields its cells against the harmful effects of heavy metals and the negative effects of free radicals, it also promotes the regeneration of damaged hepatocytes. Taurine is an agonist of GABA-A receptors. Thanks to this, it limits the excessive activity of the nervous system, has a soothing and calming effect, promotes a feeling of relaxation. It can also enhance the memory and cognitive functions. Taurine promotes the health of the organ of sight. It is present in the retina of the eye - it protects its structures against the damage resulting from UV radiation, and also stimulates the regeneration of this breakage. In summary, Trec Nutrition Taurine 900 is an excellent choice for physically active people. It may contribute to the increase of strength and favorably affect the rate of regeneration. In addition, it has many valuable health-promoting properties. According to the manufacturer's recommendation, 3 capsules should be used daily. Even higher doses are safe for the body, because excess taurine is easily excreted with the urine. Despite this, studies have not proven that they will bring greater benefits. Particularly vulnerable to taurine deficiencies are people using vegan and vegetarian diets. In addition, beta-alanine, which is popular in sports supplementation, can negatively affect the level of taurine by blocking the action of its transporter. For this reason, you can find the recommendations for the inclusion of taurine for the beta-alanine supplementation, but they should not be taken at the same time. Remember that the energy drinks are not a good source of taurine. The stimulants which are present in their composition (mainly caffeine) and sugar destroy its pro-health properties. To get the most out of the taurine potential you should choose pure taurine from proven sources. Capsule shell (gelatin, dye - titanium dioxide); anti-caking agent - magnesium salts of fatty acids.